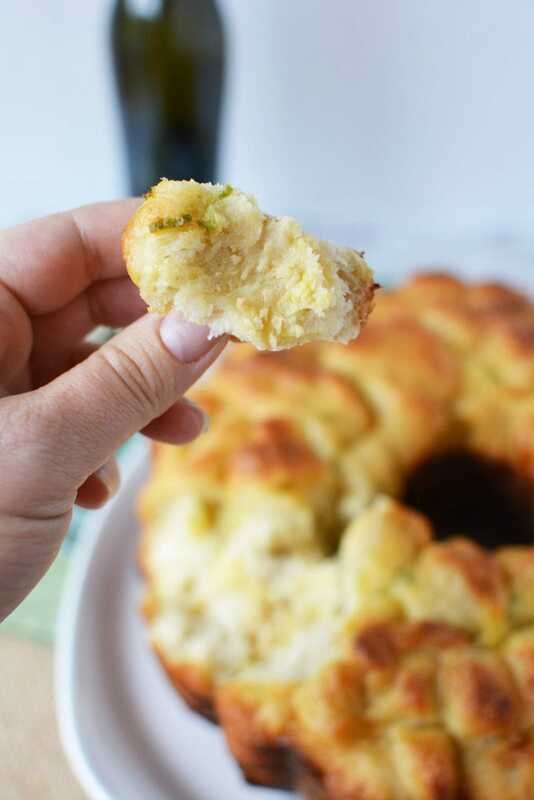 Pull apart cheese bread is the way to make friends, people. 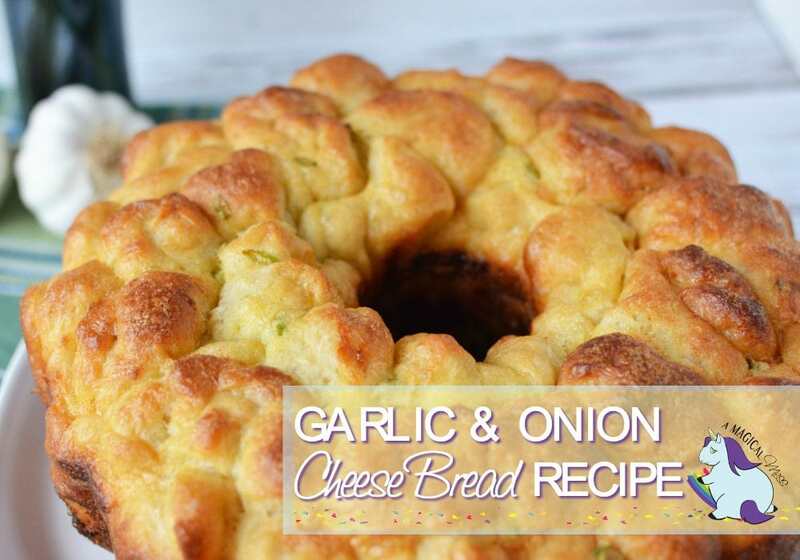 If you want to impress your guests this holiday season, garlic and onion cheese bread is a tasty way to do so. 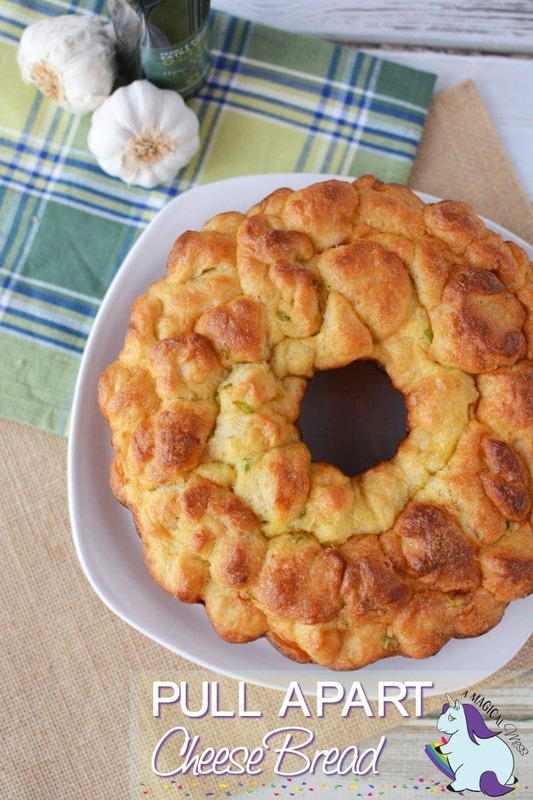 This savory appetizer is a bit like monkey bread, only cheesy instead of sweet. 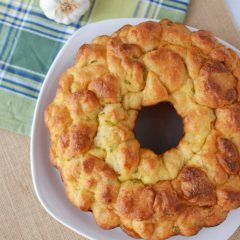 Pull apart cheese bread is a hit on Christmas, New Year’s Eve, and any other time you have people over. If you plan on entertaining this holiday season, be sure to pin this recipe. Pull apart bread is one of those appetizers that looks a lot harder than it is. It’s also quite versatile in that you can switch up the ingredients easily. Don’t like onions? Skip them without destroying the recipe. Add in different flavors of cheese, or anything else you think might be delicious. This cheesy bread is good enough on its own, but some people might like the option of a dip. I would suggest adding a bowl of marinara sauce for dipping. If you have any other suggestions for dips that would go well with this bread, please let us know. 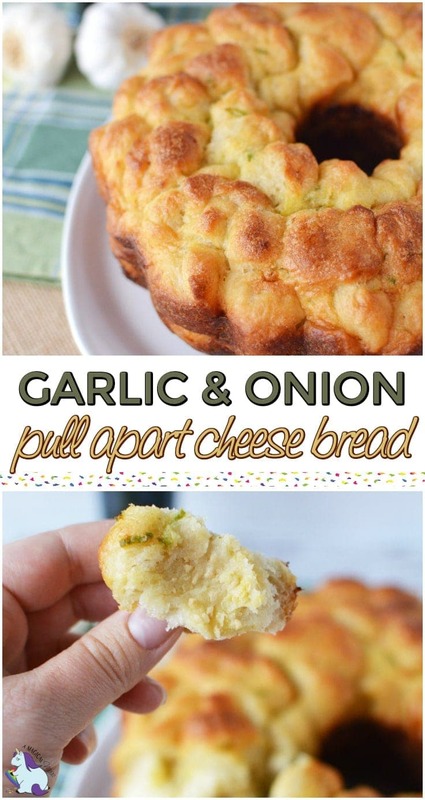 Pull apart cheese bread is a great option for an appetizer. Also good served with a marinara sauce dip. Preheat oven to 350 degrees and grease a bundt pan with cooking spray. Add eggs, onions, garlic powder, and salt in a mixing bowl. Beat well by hand. Add melted butter and mix well. Cut each roll in half and roll into a ball. 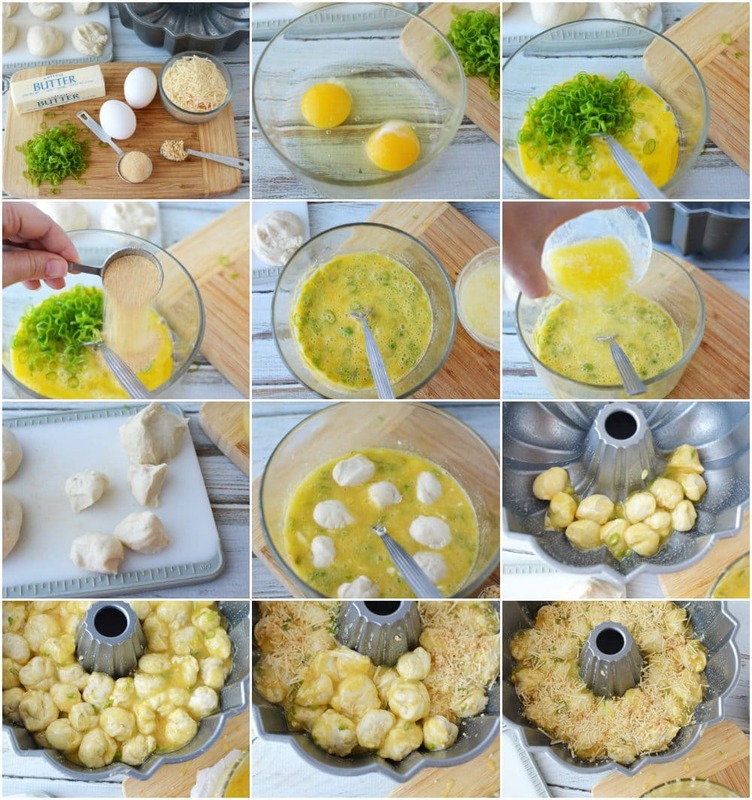 Dip into egg mixture, several dough balls at a time, and place into prepared pan. Once the first layer of dough is in the pan, add minced garlic and shredded cheese. Repeat by adding dough to egg mix and adding a second layer. Cool, upside down, on a cooling rack before serving. This cheesy appetizer is ideal for all sorts of gatherings. Bread works for all hours of the day right? Serve it at a holiday brunch, family lunch, girls’ night in, ugly Christmas sweater party, whatever occasion you choose to celebrate – I vote that pull apart cheese bread will be a welcome party food. It can even be a super treat for after school study sessions, or just a way to make an average dinner amazing. If you make this cheese stuffed pull apart bread, please let us know how you like it. Do you make pull apart cheese bread? What else do you put in it? Garlic, onion and cheese? I’ll take all of them. Looks so good. This looks so good and would be perfect for lasanga or spaghetti night at our house. This sounds delicious. The flavors kinda remind me of a biscuit that my mom bakes, but with a couple of variations. Love the idea of putting scallions in it.